Heroku Enterprise is a flexible platform for developers that lets them build apps using their preferred languages and tools like Ruby, Node.js, Python, Java, etc., and then deploy them in seconds. Heroku Enterprise offers such flexibility for developers while maintaining the enterprise trust and control they require. With Heroku Enterprise, developers can use the Salesforce App Cloud to build apps using programming tools such as Ruby, Node.js, Python, Java and more. The apps can then be deployed in seconds after their creation. App development teams can leverage the powerful tools that come with Heroku Enterprise including mart containers and instant scalability as well as support for continuous delivery and collaborative development. The platform is also integrated with 150 pre-integrated add-ons and managed data services, all of which are optimized so that app developers can create amazing, useful apps in a breeze. Apps developed using the Salesforce App Cloud enjoy the flexibility that comes with the cloud while maintaining the control offered by an on-premise application. Every enterprise has its own characteristics, and might call for a particular type of IT Development Software solution that will be adjusted to their company size, type of clients and staff and even specific niche they deal with. We advise you don't count on getting an ideal software that is going to be suitable for each business regardless of their history is. It may be a good idea to read a few Heroku Enterprise reviews first and even then you should remember what the software is supposed to do for your business and your staff. Do you require a simple and intuitive app with only basic functions? Will you really make use of the advanced tools required by experts and big enterprises? Are there any specific features that are especially useful for the industry you work in? If you ask yourself these questions it will be much easier to find a solid service that will match your budget. How Much Does Heroku Enterprise Cost? Heroku Enterprise is one of the many products listed under Salesforce App Cloud, which is available in four pricing options. A free trial version for every package is also available. We realize that when you make a decision to buy IT Management Software it’s important not only to see how experts evaluate it in their reviews, but also to find out if the real people and companies that buy it are actually satisfied with the product. That’s why we’ve created our behavior-based Customer Satisfaction Algorithm™ that gathers customer reviews, comments and Heroku Enterprise reviews across a wide range of social media sites. The data is then presented in an easy to digest form showing how many people had positive and negative experience with Heroku Enterprise. With that information at hand you should be equipped to make an informed buying decision that you won’t regret. What are Heroku Enterprise pricing details? What integrations are available for Heroku Enterprise? Salesforce App Cloud: Heroku Enterprise comes with 150 pre-integrated add-ons. Pros: It makes deployment process easily, if you want to work with Ralis and Python framework you should start with Heroku. You can easily remove deployment barrier and start sharing the code. The require maintenance is great. It has great support service and if it happens to fail while working they will resolve the problem. Cons: When you reach a certain level of traffic and complexity the price is going up. But, from a financial perspective this product is worth the price because you have enough knowledge and experience and you can easily move it to higher maintenance. Pros: Heroku is very customizable software and provides great number of program languages such as: Ruby, Node.js, Go and even PHP. When you use it for free you will get its functionalities and it will definitely meet the needs of some small and personal app. You can even use a single dyno if you want to. This platform offers great catalogue of add-ons so you can easily make integration with databases and applications. Cons: When it comes to personal usage you can use it for free and you are able to enjoy great features, but if you use it for professional purposes the price is very high. 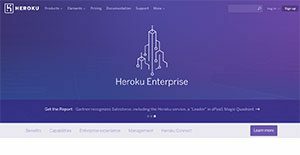 If you need more information about Heroku Enterprise or you simply have a question let us know what you need and we’ll forward your request directly to the vendor.